As you know comex released his universal jailbreak for each and every iDevice (iOS 4.0, 4.0.1) available on the earth. To apply the jailbreak solution, you need to visit to jailbreakme.com with mobile Safari, then slide with finger-tip is enough to make your unit free from Apple’s restrictions. Since the recent release of Jailbreak method exploits a vulnerability in Safari should have the next update iOS stop the iPhone easy hack. 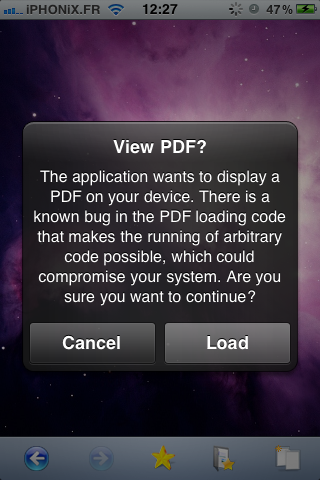 JailbreakMe seems to be based on a PDF vulnerability that is active in Safari and, potentially, could lead to malicious software sent to users via emails and the browser. JailbreakMe includes a control code that runs at the end of the unlock process and is able to determine if the jailbreak is done properly and then plug the hole represented by the use of false PDF to install the code. 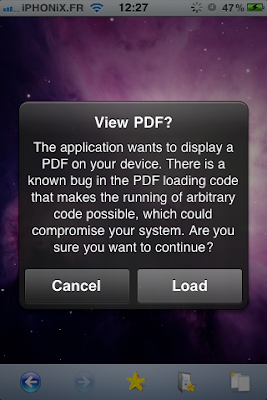 Now understand that many hackers are aware of the possibility to run the code through the PDF. So anybody with good hacking skills can use this discovery to install malicious code on your devices. 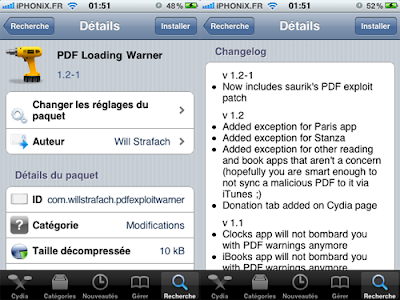 cdevwill member of chronic dev-team released a little utility called PDF Loading Warner. After installing this little package if you visit to the “malicious site” you will get a pop-up to warn you about danger, you must logically deny the execution of the code. If you are downloading a file from a trusted source, click “Load”, otherwise “Cancel”.